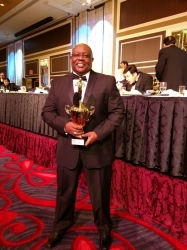 Durham, NC, February 02, 2018 --(PR.com)-- Jessie Bowen for the 2nd year received International Honors from Action Martial Arts Magazine Hall of Honors on Saturday, January 26, 2018, in Atlantic City, New Jersey. The Action Martial Arts Magazine and Hall of Honors is the largest Hall of Fame in the world with over 1500 people in attendance. The event features Martial Artists and Martial Arts Film Stars from around the world. Cynthia Rothrock, Don the Dragon Wilson, Cary-Hiroyuki Tagawa, and others were in attendance. The event honored Jessie Bowen owner of Karate International of Durham and founder/host of the AMAA Martial Arts Masters Blog Radio Network for his continued support for the enhancement of the martial arts. Jessie was the recipient of the Action Martial Arts Magazine Hall of Honors Radio and Media Coverage Award. This is the first award given in this category. He has been doing blogtalk radio since 1998. The AMAA Martial Arts Masters Radio Network hosts other talk radio shows including Professor Gary Lee, Master Martial Arts, founder of the Sport Karate Museum, Huston, TX., Pioneer and Legends in the Martial Arts; Karen Hardeman, Master Martial Arts, Columnist for Taekwondo Times and MASuccess Magazine; Gwendolyn Bowen, Minister and Spiritual Empowerment Coach, and Jessie’s Empower Lunch and Learns. The book, is considered to be the history book of today's martial arts. Other Honored Awards in 2017 include AFKA Karate Hall of Fame Excellence in Martial Arts Journalism Award and the Induction in the Martial Arts Sport Karate Museum as a Martial Arts History General. He retired from Duke University’s Physical Education Department in 2016 after 27 years of teaching Martial Arts, Mindfulness, Kickboxing, and Bowling. He has won over 2000 awards in Martial Arts Competition, 2 World Titles, Professional Bowler, former North Carolina and USOC Taekwondo Sports Coordinator. He opened Karate International of Durham in August of 1980, produced over 1000 Black Belts along with being Martial Arts Tournament Promoter for the Durham Karate Open and the AMAA Nationals. About the Author: Jessie Bowen, lives in Durham North Carolina, with his wife Gwendolyn Bowen, and father of 4. He is a 10th-Degree Black Belt, Motivational Speaker, and Corporate Educator for Duke Corporate Education.